I am a huge lychee fan… and I mean huge. So I’ve been on a mission to try the lychee’s siter fruits — the longan and the rambutan. All three fruit come from various parts of Asian and are used in Asian cuisine. I scored some longanback in October (in China Town, Boston) and while I enjoyed them, I still preferred the taste of lychee. So when I was at Russo’s Marketlast week and spied a pile of Rambutan (out of season, so $5.98/lb), I decided to grab three — one for the boy, one for the Husband and one for moi. According to Wikipedia, the word rambutan translates to the word hairy, in both Indonesian and Malay… and that’s because… well… the rambutan looks pretty damn hairy! 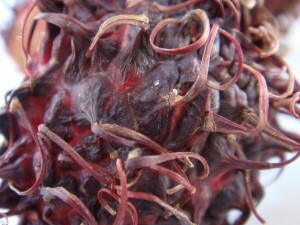 Though they look sort of prickly, the spines on the rambutan are actually quite soft. The skin is leathery, just like the lychee and longan. 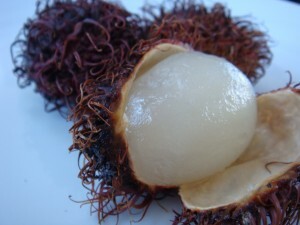 I find that lychee skin is the thinnest and is easily peeled away by picking with your fingernail. The longan is has the next thickest skin, and if I remember correctly, we were able to “start” the peeling of them with our finers as well. 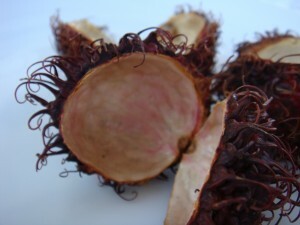 The rambutan however, has much thicker skin… so it took a sharp knife to crack the skin and to get it to peel away. The texture of the fruit is the same as the lychee and logan and the pit is similar in that it takes up a good part of the fruit. The flesh is juicy, sweet and succulent. I have decided that the rambutan is my favorite of these three fruits… it’s hard to explain why, as their flavors are subtly different, yet similar. 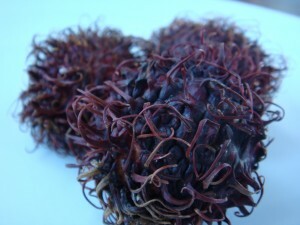 The rambutan seems to be fresher, with less of a rotting fruit undertone. The fruit is also larger, so you get more bang for your buck. The Husband and 4-yo both agreed that they were delicious and I think we all were wishing there were more. Perhaps when they come into season I’ll buy a bunch. They would make a great martini, but to be honest… would prefer to eat them raw — right out of the shell.